"Like" token, awarded by liuxinyu970226. "Like" token, awarded by rbalik. "Love" token, awarded by Darakir. "Like" token, awarded by kuba-orlik. "Love" token, awarded by backstageel. "Like" token, awarded by greenhatman. "Like" token, awarded by tiagolarafranca. "Mountain of Wealth" token, awarded by jsixface. "Like" token, awarded by monsdar. "Love" token, awarded by jarrod. "Like" token, awarded by wschroo. "Love" token, awarded by subhra.roy. "Like" token, awarded by orvisoft. "Like" token, awarded by frogman544. "Mountain of Wealth" token, awarded by michaeljs1990. "Love" token, awarded by lavahot. "Like" token, awarded by stevex. "Like" token, awarded by charlesnie1027. "Like" token, awarded by noisy. "Mountain of Wealth" token, awarded by svemir. "Like" token, awarded by WeiLi. "Like" token, awarded by g-p-g."Like" token, awarded by cpa199. "Like" token, awarded by qgil. "Like" token, awarded by kmuncie. Some teams organize their work around sprints, selecting a group of tasks to be completed within a time frame. These times usually want to follow the progress done at any point of time. 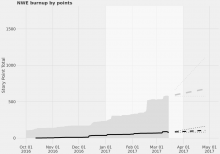 Burn down charts offer a visualization of this progress. Create a project for the iteration, i.e. "Phabricator Burndown 23". Define the start and end dates of the sprint. Assign the tasks committed for that sprint. Optionally, assign estimated effort points to each task. This will generate a graph with an ideal work remaining line and columns for each day within the sprint. The planned velocity of the sprint could be shown as well. The same page could include the list of tasks included in the sprint and their current status. Difference between ideal and actual velocity. Difference between planned and actually completed tasks. Difference between estimated and actual effort points burned. These numbers are meant to help teams planning future sprints accordingly. If Phabricator would support subprojects, then it would be useful to provide an overview comparing the results of every sprint, but we are not there yet. Possibility to create a custom field for agile points in tasks. Potentially recyclable functionality and UI in Burnup Rate and Fact. Start and end date for projects, in order to convert them in sprints. Limiting the charts to the dates of the sprint. Adding a line in the charts reflecting the ideal progress based on estimated points. Nice to have: adding to the charts the number of tasks completed every day. Image source: Wikidata Developers Team. This task was originally reported at http://fab.wmflabs.org/T244 (site replaced, data is now here: https://phabricator.wikimedia.org/T153). @Swidmann is a PHP developer active in the MediaWiki / Wikimedia community, and he is willing to work on this after syncing plans here. @calfzhou see D12526, and then https://gerrit.wikimedia.org/r/#/c/207415/3/src/view/reports/SprintReportOpenTasksView.php as an example to how to fix it. @dpaola2: Your issue should have been fixed just recently. thanks @g-p-g and @dpaola2, all those fixes work! • lavahot added a subscriber: • lavahot. Anyone still actively working on getting this merged into master? This looks great and I want to use it! I have installed it and can see Sprint Start Date and Sprint End Date in my project details. I am getting Call to undefined method ManiphestTaskQuery::needProjectPHIDs() when I try to view a task. The upstream will not help you resolve issues with third-party extensions (see T5447). You need to report these issues to the extension maintainer, not here in the upstream. work with current Phabricator. But please do take issues up with them. • frogman544 added a subscriber: • frogman544. I am also facing same problem but there is no errors shown in my installation. I had seen this https://gerrit.wikimedia.org/r/#/c/207415/3/src/view/reports/SprintReportOpenTasksView.php can see its already implemented in my code. Looks like my code is having this patch since day 1. Anyone having information about main problem/ root cause of all this? chad removed Swidmann as the assignee of this task. This task has morphed a bit, so clarifying the current intent. If you're interested in Sprint/Milestone support, which is actively being built, please follow T9378, T3670. This task will be re-scoped to just being about burn down charts for milestones. wschroo added a subscriber: wschroo. jarrod added a subscriber: jarrod. monsdar added a subscriber: monsdar. Since the number of subscribers and tokens, and number of stars of the mediawiki extension on github, seems this graph will be of very much interest for a lot of people if incorporated in the core. Personally I find "This project is 3 days behind schedule." more interesting. "70% complete" can be good news or bad news, depending of the point of time. 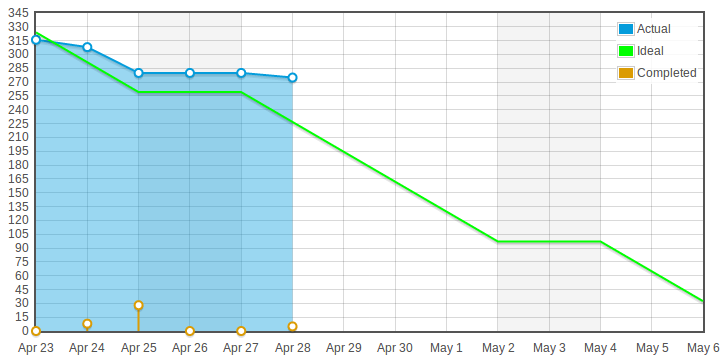 In the graph you can estimate schedule more than actual implementation that show points completed over total. Here are some additional use cases and a sample implementation that is a Burn-up chart, not a Burndown chart, plus rationale. As a Product Manager, I want to understand if a project is likely to meet a deadline, so that I can take action (such as reducing scope, reprioritizing work, or changing staffing). As a Product Manager, I want to differentiate between the two factors affecting a project burnup, changes to scope of work vs velocity of completion, so that I can more accurately decide which actions to take. As a Product Manager, I want to understand if a project is likely to meet a deadline, so that I can decide whether to make a public announcement, or when or what. A burnup chart offers several advantages over a burndown chart. Primarily, it shows two different pieces of information, total scope of work and total amount of work completed. These are conflated in a burndown chart, so that “more work was added to the scope” looks the same as “a bunch of work previously thought completed was found not to be completed”, and “no work is being completed” looks the same as “lots of work is being completed but new work is being added at the same rate”. In the burndown example in the Feature Request Description above, Completed is shown as a separate series, but identifying scope changes is still not practical: either the Actual line is allowed to jump up and down, forcing the user to back out scope changes from progress by subtracting an instantaneous value from a cumulative value (much harder than comparing two slopes visually), and also introducing the nonsensical possibility of Actual work Remaining dropping below the X axis; or, as was implemented in Phragile, the Actual work changes retroactively whenever scope changes, so scope change information is not present in the graph. 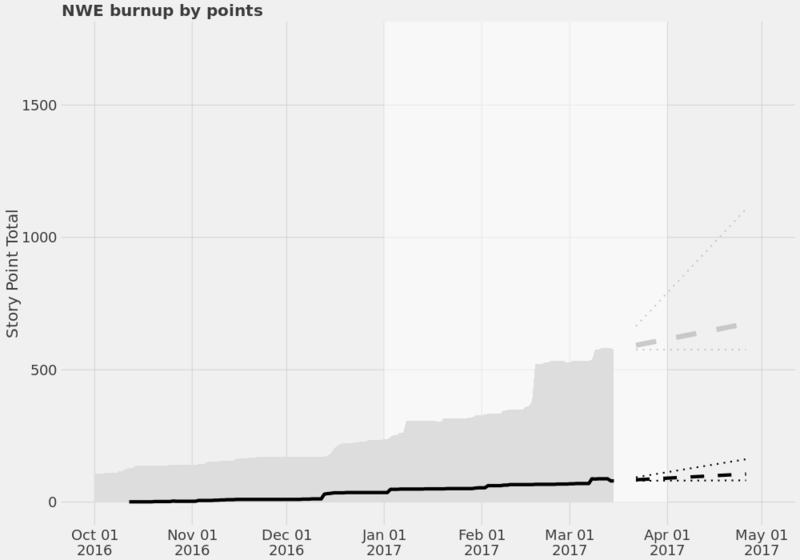 Burnup charts allow for a much more natural presentation of forecasting, by comparing the slopes of the two lines and looking for an interception point. This can even by done by eyeball, without any calculated forecast data. backstageel added a subscriber: backstageel. kuba-orlik added a subscriber: kuba-orlik. Darakir added a subscriber: Darakir.